When it comes to fitting your windows with plantation shutters, aesthetics is always going to be a concern. They have a distinct style and profile already and many go with real, natural wood to maximise the timeless charm even further. But aesthetics isn’t all that matters. If you want the look, but you also want a choice that’s suitable for the specifics of the room, not to mention your budget. For that reason, faux wood shutters have become a highly popular choice. Faux wood shutters are often considered the “middle ground” between vinyl and real wood. While vinyl shutters are made entirely of PVC, faux wood shutters are made of a composite wood material coating with PVC. Unlike PVC, it’s not flimsy enough to sag if the shutters are too large. What’s more, the composite wood is often made from recycled material, making it a more environmentally friendly choice. With the right maintenance, faux wood shutters can last as long as fifty years without chipping. Of all the different shutter options, natural wood is, and will always be, the priciest. Price ranges depend on what kind of wood, exactly, you want to use, but no natural wood shutters will be as inexpensive as vinyl or faux wood shutters of the same size and shape. Both vinyl and faux wood allow for patterns that perfectly replicate the look of authentic wood. However, only faux wood allows the solidity and sturdiness that makes the illusion all-the-more real. While you cannot repaint it as you could with real wood to change the aesthetic, faux wood also doesn’t require the repainting and refinishing that real wood does. All it needs is a little maintenance to stop it from discolouring and you can get that real wood appeal without the effort or the expense. The biggest advantage of faux wood (and conversely the biggest disadvantage of real wood) is how it handles different environments. Particularly, environments that involve any kind of moisture. Real wood is greatly unsuitable for kitchens, bathrooms, and outdoor shutters where moisture and humidity may prove an issue. As time goes on, the protective coating on wooden shutters can degrade and leave material exposed. Then, it can warp and begin to degrade in moist or humid conditions. Faux wood, on the other hand, is both water and weather proof. This means you can still have the look and feel of real wood, but you don’t have to worry about the consequences of having it in the bathroom or on the exterior of the home. When cleaning real wood shutters, you also have to deal with the concern of drying it out quickly, while you can get more thorough with faux wood without worries. Furthermore, you don’t have to worry about faux wood fading in the sun as real wood can. Broadly speaking, both natural wood and faux wood shutters are remarkably easy to clean. Most of the time, only a little dusting and the occasional wipe down is necessary to keep their appeal and help them stay fresh looking. As mentioned, however, cleaning real wood more thoroughly can be a hassle due to the need to keep the material dry. Faux wood doesn’t have that concern. You can even hose down faux wood shutters on the exterior of the home. One of the biggest appeals of shutters is how much control they allow over the environment in the home. Controlling how much privacy you enjoy, how much natural light you let in the room, and even the climate are the practical advantages it offers over other window treatments. 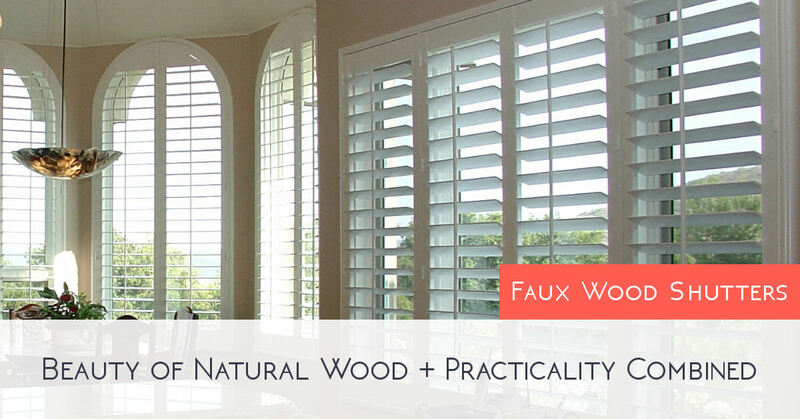 In that regard, faux wood shutters excel over even real wood. While real wood shutters offer great energy efficiency, faux wood blocks heat from escaping in the winter, or heat entering through the window in the summer, by up to 70% more. Not only does this mean it’s easier to change the climate of the home as you wish, it can also mean real money saved on the home’s fuel bills. Cheaper than wood, stronger than vinyl, more environmentally friendly than both, faux wood has several significant advantages that make it not just the ‘in-between’ choice but an option worth considering in its own merit. Think about where you want your shutters, what you need from them, and how big your budget is. Faux wood shutters could just be the perfect choice for your home in Essex and the surrounding areas.. Still undecided? Lifestyle Shutters are here to help you. We’re are only a call away.